I've been admiring the crazy quilts I see on flickr and really wanted, for quite a while, to try one of my own. It really seemed quite difficult to me. I know ... they say it's easy. I've asked, they've told me. But it really seemed quite difficult anyway. Last week I decided to try one square, just one. No grand hopes of success, believe me. And it was fun! It was really fun. I was hooked. One square turned into 25, and then turned into this little quilt (clicking on the images will show them larger). The squares did take quite a while to make, especially with the embroidery (all done on the machine) stitching on all the seams, so I stopped at 25 squares. I think, though, that'd it be easy to make a few in my free time and then, when I've collected enough, make a quilt or bag from that. I opted to use a lot of white on this quilt. 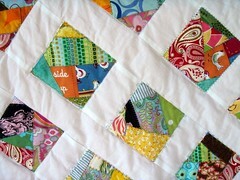 I wanted to draw attention to the individual crazy quilted squares, and to keep the quilt from being too busy. I'm not sure why I'm so drawn to blank, or solid color spaces right now ... this isn't the first thing I've made lately that has a lot of clean white space. I think it's a desire for order and calm (geez .. who'd want order and calm?). Whatever it is ... I like the look. The backing fabric was a challenge, which annoyed the heck out of me since this was a quilt made largely from scraps of fabric and was very random. The problem, though, was that it had to be gender neutral, not too expensive, and I didn't want stripes. Apparently that's a challenging combination this February. My mother picked out the orange and while I'm not thrilled with it it really adds to the cheery brightness of the quilt. 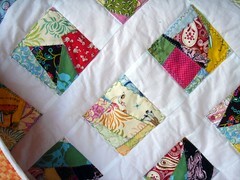 And then there was the quilting ... oh my goodness. 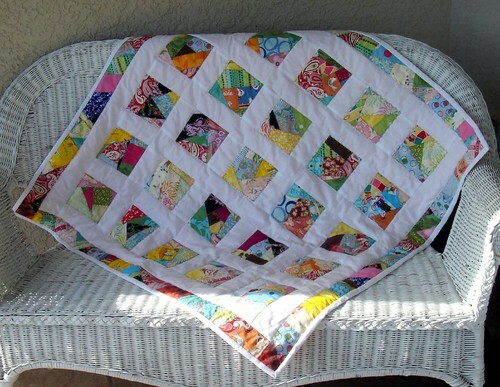 I googled and searched flickr for similar quilts and I found tons with white space like this one. But they were all tops. None of them were shown quilted. None. NONE. I ended up just quilting around the squares and it turned out fine, but I'd hoped to do more with it, again leaving the focus on the quilted squares. I'm still not exactly sure what I was looking for. As I was using up the scraps I wondered why I always feel like I should keep these quilts, made from pieces of fabric I already have. And I realized it's not the fact that they're made from "scraps", but the fact that they have meaning to me. Many of these fabrics are in things I made for my kids or for friends. I know where 95% of these fabrics came from, when they were bought, why they were bought, who was with me. Every piece tells a story ... to me. I know what I made from them and who it was for. And someone buying it won't know those stories, and, strangely, that makes me sad. I almost want to go through each square and add a note about the fabrics so they can cherish them as much as I do ... which would certainly made me looks like I'm completely nuts. So I have to comfort myself in the fact that the new owner will create their own memories with the quilt, and love it in their own way. Sooner or later this quilt will make it's way to etsy. this is such a wonderful quilt. color and layout are so inspiring to me. whoever ends up with this quilt is a lucky person. This quilt is gorgeous. I love the embroidery on the squares - my sewing machine unfortunately does not do fancy stitches! The backing is striking. I think your mother chose really well! Jolly good show! I really love this quilt! 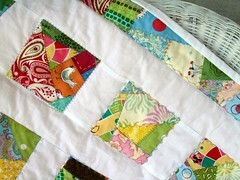 I love how you added the white to the crazy quilts. I have also been drawn to doing that lately myself. I love how bright and cheerful it is with out being overwhelming. Great job! our quilt is beautiful. So fresh and summery. 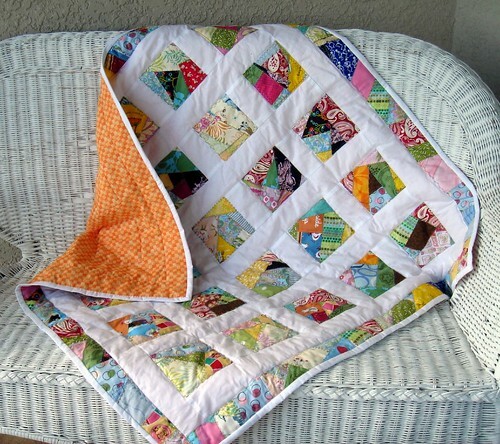 I have always loved colorful quilts that have a lot of white. oops that was supposed to be "Your" quilt. Unless your planning on sharing it with me. Lol! I'm hyperventilating over the deliciousness that is this quilt! Wow! I love it! Love the crispness of the white, makes the crazy squares pop to the surface! Lovely! What a beautiful quilt - and I so understand your feelings about the pieces having meaning! !